Conspiracy theories exist for every big situation, especially music. Scenarios include industry plants (major label backed artists who appear to organically build a buzz) and labels buying albums to boost sales to name a couple. That’s just what we’ve thought about publicly. So, I propose this question: what if Lil Wayne and his team created the whole Carter 3 leaks era? Here’s what likely happened. Wayne had several engineers, like Mike Banger, Deezle, and Fabian Marasciullo. Suppose one of his engineers, which isn’t limited to those three, isn’t making a living currently. Weezy makes five songs in two days. Fans aren’t going to get treated to all of them. The origins of the leaks can be traced back to a quote by Andrew “Drew” Correa, his former engineer. “I think when his album started leaking was after I quit working for him [in July 2007] and he started going to different engineers,” Drew told XXL in 2008. He also said he kept a personal hard drive, so no leaks. Anyways, the engineer is approached by a DJ who has a proposal to make some extra cash. If you’re thinking, “nobody takes that risk for some money,” then you’re not very invested in how people function in this day and age. Cash still rules everything around us. Naturally, the actual details would’ve been different. That’s just the fictional take. However, I’ve begun to question if that happened. Fabian is the only engineer Wayne works with nowadays. That’s not necessarily due to relationships deteriorating elsewhere. Wayne just wanted a more tight knit circle, which worked well for Tha Carter IV. Take a look at songs in Tha Drought Is Over series. “Help,” “One Night Only,” “Something You Forgot,” and “Diamonds & Girls” have something in common: the samples. There’s The Beatles, Jennifer Holliday, Heart and Prince on those. During this era, Wayne must’ve had a serious thirst for a hot sample, because they are littered within leaks. Yes, the official Tha Carter 3 had sampled songs on it that had to be cleared. It’d be hard to believe that Wayne, one of the biggest artists at the time, would have any issue with sample clearances. However, considering the vast amount of samples, it wouldn’t have been wise to construct an album in such a manner. A few clearances wouldn’t present issues but an abundance would’ve been crazy for publishing and royalties. Lil Wayne had the cheat code. He was sought out as an in demand guest feature, but taking it a step further meant his actual songs would start to come out. The impact of the music is undeniable. Every true Wayne fan could give you their top 10 of his catalog and have at least one song that wasn’t officially released in it. “I Feel Like Dying” had over 45 million views on Youtube. Combining all the different channels that uploaded it, “Something You Forgot” surpasses that. These are numbers reserved for the elite. Eminem videos and hit singles get that much. Not mixtape leaks. They’ve become much more than that. An instrumental part of the evolution to ‘best rapper alive’ status. The fallout over the leaks headed in a bad direction if not for the fact that Lil Wayne was the biggest name in rap. Instead of targeting The Empire, Wayne fired at mixtape DJs. It sounds like a bold move yet he was pretty much untouchable. There was a bit of chatter online, but nothing that caused permanent damage. It sounds like a well calculated move. When the creative juices are overflowing, it creates a ton of material that doesn’t have a place in this world. Rappers can’t release song after song, mixtape after mixtape, and expect fans to be able to enjoy everything. Lil Wayne’s career took a risk that we may never see again in the industry. And I still feel like he did it himself. His team and him knew what they were doing. 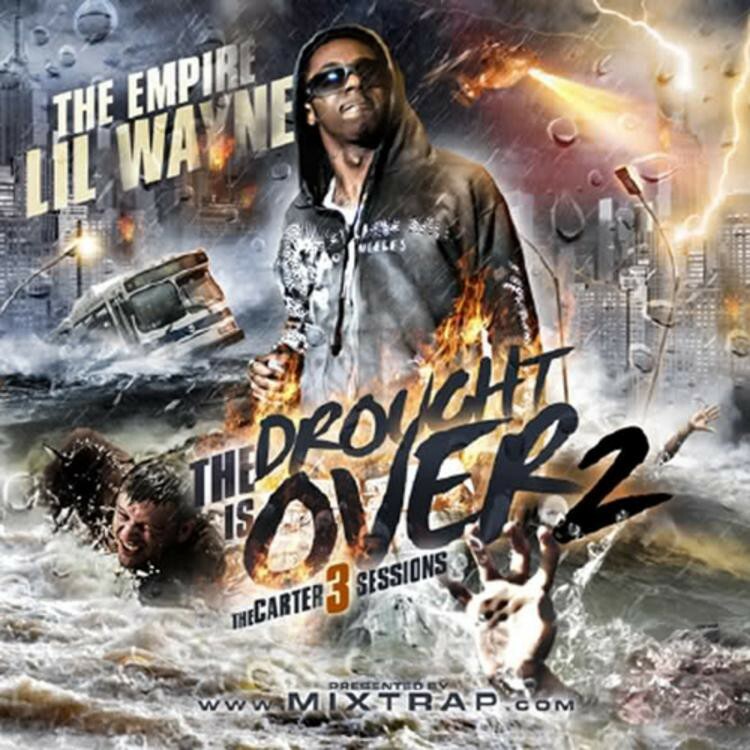 Drought Is Over 2 was the worst in the series from a leak standpoint. However, Wayne did nothing to prevent this from happening again. It doesn’t seem like all of the songs from The Empire’s classic series were bought in one batch, then spread out through six installments. There had to have been multiple purchases. Initially, the leaks were out of Wayne’s control. Drought Is Over 4 was bigger and had more records. By this point, some control seems likely on his behalf. He knew that this method would continue to work for a while after the success of the second one. In October 2007, he spoke to MTV about the power of the leaks. This trend winded up being a beneficial situation in lieu of rushing Tha Carter 3. Could he have did a million first week if C3 dropped in 2007? It’s a stretch. The leaks not only raised his profile with his own catalog, but made artists want to work with him even more. He was in his prime and determined to make it last as long, and an impact that is still talked about regularly. Whether conscious or unconscious, Lil Wayne’s C3 leaks era will be regarded as one of the internet’s best music moments. The brunt situation paved the way for artists to be more cautious about how their music is passed around. Leaks always make their way online and it opened the industry’s eyes. Fans don’t care about that aspect, though. Looking back, they’ve received countless songs that never would’ve seen the light of day. Some of Wayne’s best work, his honest records, included. And, to think, it all could’ve been a well executed marketing ploy.